СММ-4RP Adsorbent Regeneration (Reactivation) Unit - ! Equipment for Transformer Oil Reclamation. GlobeCore. 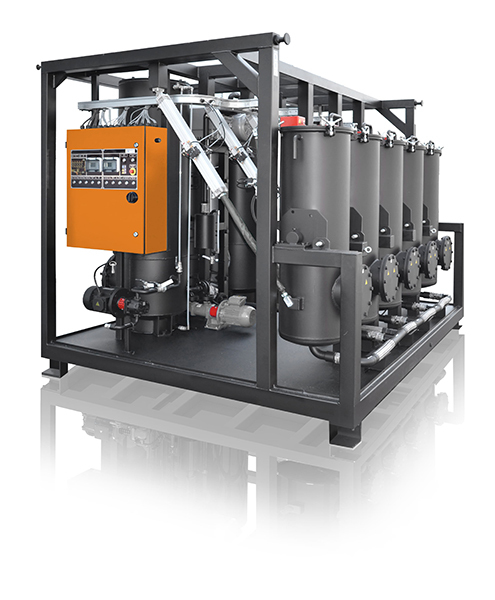 The СММ-4RP unit is designed for reconditioning of waste sorbents used in oil purification systems. This equipment can be used by companies dealing with purification and regeneration of oils, diesel fuels, fuel oils and other oil products. The sorbent saturated with impurities is loaded into tilting columns. Under high temperature and vacuum, the contamination is removed from the sorbent. The impurities are directed to the liquid trap through contaminant output system, and are then pumped by transfer pump from the trap to the buffer tank. Afterwards, the liquid is pumped out of the buffer tank the output pump. The total duration of the reactivation process is about 20 hours. Upon completion of the reactivation process, the lids of the columns are opened by pneumatic cylinders. Columns are tilted upside down and the sorbent is unloaded. It can then be loaded into sorbent cartridges of oil purification units and reused. waste sorbent can be deactivated. After deactivation, it doesn’t contain residual oil and can be disposed as regular construction waste without environmental pollution.